Peppermint tea, made from the leaves of the peppermint plant, is often used for its medicinal qualities to alleviate ailments such as digestive concerns, pain and anxiety. Peppermint tea also might help suppress your appetite to aid in weight loss, although the scent of the peppermint, rather than the consumption of the tea, seems to cause the effect. Scent travels from the nose to the brain, and can affect the part of the hypothalamus that registers satiety; your brain then releases hormones that suppress your appetite. A 2009 article in “The New York Times” explains that peppermint is one scent that might have this effect. Your sense of smell greatly affects taste, so scent might cause you to eat less. However, more research is needed to confirm the potential link between peppermint scent and appetite suppression. The scent of peppermint affected the appetite of study participants in a 2007 study by Wheeling Jesuit University. When inhaling the peppermint scent every two hours, participants reported feeling significantly less hungry and that they ate 1,800 fewer calories than normal. The researchers noted that peppermint scent can also reduce cravings and can reduce the intake of fat and sugar. To make peppermint tea, add 1 teaspoon of dried peppermint leaves to one cup of boiling water and steep the leaves for 10 minutes. Strain them, and drink the tea up to five times a day. For an easier version, purchase pre-packaged peppermint teabags and follow the package directions to prepare the tea. The University of Maryland Medical Center notes that large quantities of peppermint tea do not appear to have adverse effects. However, you should avoid peppermint tea if you have a hiatal hernia or gastroesophageal reflux disease, or are pregnant or breastfeeding. 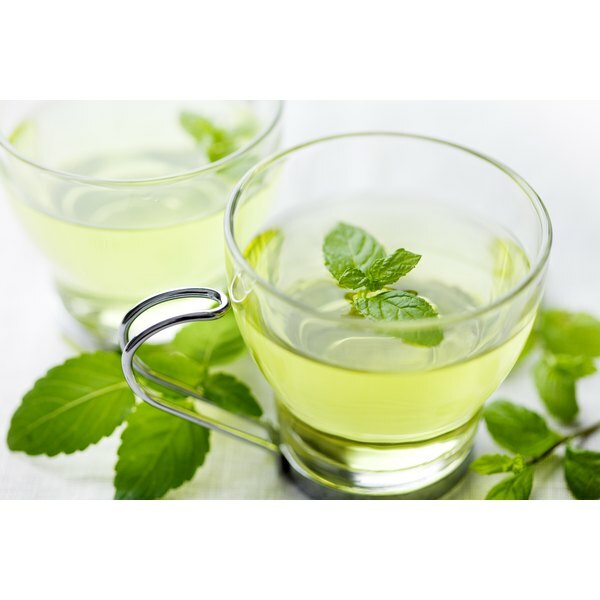 There is a risk that peppermint tea might worsen gallstones and heartburn.